This article originally appeared in the Winter 2009 WNP Member Newsletter. Golden Gate Park was conceived in the 1870s as an urban oasis for San Francisco residents and visitors to escape the hectic pace and din of the city core, to wander among the trees and flowers of a country setting. The street grid of the city would give way to meandering paths and roads in the thousand-acre park. By the early twentieth century, with expansion of the city to the areas around Golden Gate Park, this bucolic oasis became an obstacle for residents to cross. These conflicts of interests and how they were fought left a legacy still evident in the park's use today. Golden Gate Park is one-half mile wide, flanked on both the north and south sides by the grid of streets known as the Richmond and Sunset Districts. The lovely curving roads of the park were laid out to enhance the gentle flow of the wanderer. The Park Commission, from the beginning, had to contend with people who wanted to race their horses and buggies through the park, endangering pedestrians and bicyclists. By the time the "horseless carriage" came along, the commission tried everything from a total ban, to limited operational permits, to strict speed rules, in an effort to control the noisy, exhaust-belching automobiles from disrupting the tranquil enjoyment of Golden Gate Park. Crossing the park with heavy wagons or trucks was limited only to Crossover Drive from remote 24th Avenue and Fulton Street to 19th and Lincoln Way. The idea of a streetcar crossing through the park would meet with vigorous opposition from the superintendent and the Park Commission. Yet residents of the Richmond or Sunset Districts, without personal transportation, who wished to visit the district on the other side of Golden Gate Park, had to walk through the park or take a streetcar east to Divisadero Street, the closest north-south trolley line, and then head west to the area of their destination. These two opposing interests—the cross-park rail route proponents and the park commissioners committed to preserving park pleasure—would eventually have a contentious showdown. Before the 1906 earthquake and fire, the two neighborhoods on both sides of the park were sparsely populated, with many of the residents relying on their own horses and wagons for short travel. After the 1906 calamity, the rapid expansion into these two neighborhoods flanking Golden Gate Park created more urban residential neighborhoods that relied on streetcars to travel downtown for work, shopping, or recreation. By 1908, The Richmond Banner, the weekly newspaper of the Richmond District, began campaigning for a rail line across the park. On March 27, the Banner, editorializing about the need for streetcar lines into the neighborhood, said, "If a road [rail line] coming out Geary or Turk street would cross the Park between Sixth and Tenth Avenues, it would be even more valuable. The residents of the Sunset district now have but one outlet to the city and would welcome a line across the Park." The Richmond District at the time had four "roads" near the Park. The McAllister trolley line extended out Fulton Street only to 12th Avenue, where one could take a limited-schedule trolley further on Fulton to the two roadhouses at 24th and 36th avenues. 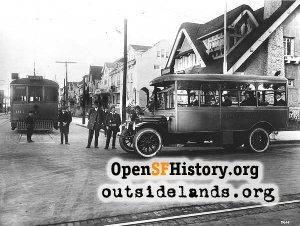 Starting in 1908, a second trolley line came from Market Street, west on Eddy, north on Divisadero to Sacramento, west to Lake Street, Lake to 6th Avenue and Clement, two blocks west on Clement, then south on 8th Avenue to the end of the line at Fulton. 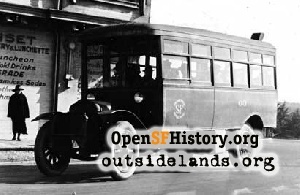 A third route, called the Mission & Chutes line, came across from 29th and Mission streets to Divisadero Street and followed the same route as the Turk-Eddy line, also terminating at 8th and Fulton. The fourth line, a cable system, came out Geary to 5th Avenue, south to Fulton, and then terminated at 12th Avenue with the McAllister line. With four streetcar lines terminating within blocks of one another on Fulton Street, there still was no way to cross Golden Gate Park by public transportation. The "one outlet to the city" on the Sunset side of the park, was along H Street (now Lincoln Way). It connected on Stanyan Street to other lines that headed east. 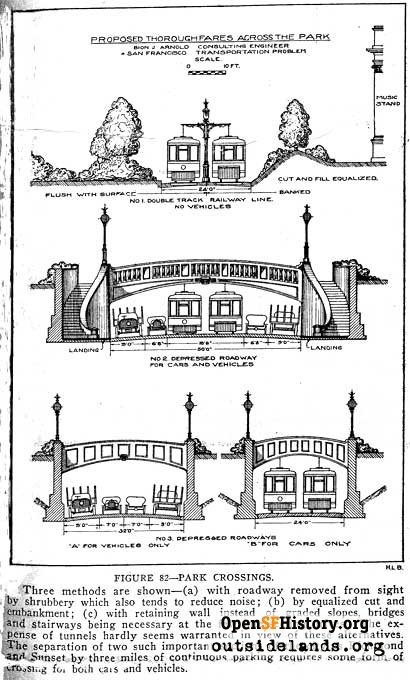 In 1909, The Richmond Banner took up the call for a cross-park route more vigorously and with more specificity. On February 5, the paper wrote, "Sunset and Richmond districts, although separated by Golden Gate Park, are, for commercial purposes, as far apart as Fillmore Street and the ocean beach." The Banner argued, "as it is not lawful for business teams to cross through the park, either an elevated railway or a subway is very badly required, and we believe the latter to be the most feasible means of establishing commercial communication between the two districts." As the June bond issue for the municipal ownership of the Geary rail line approached, the Banner encouraged support for the measure and added that a subway should be built under the park at 8th or 9th Avenue as part of the Geary Street system.1 On March 26, the Banner expanded the project scope by suggesting that a cross-park subway be wide enough to accommodate both wagon and trolley traffic. 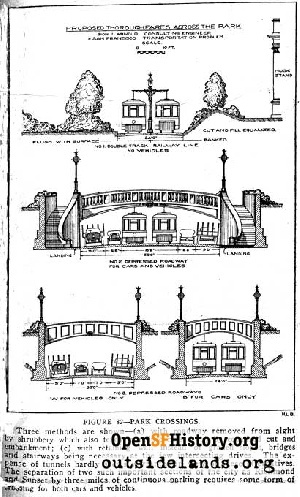 Cross-park transportation proposals for Golden Gate Park by Bion J. Arnold, submitted to the mayor and Board of Supervisors of San Francisco, March 1913. - Report on the Improvement and Development of Transportation Facilities of San Francisco, by Bion J. Arnold. The June 1909 bond issue was narrowly defeated, giving hope for success if it were quickly reintroduced. The San Francisco Examiner strongly supported municipal ownership of public transportation and utilities. On September 7, the Examiner unveiled an ambitious master transit plan calling for two subways across Golden Gate Park, at 10th Avenue and at 33rd Avenue. The Board of Supervisors, having had bond issues on municipal ownership of the Geary Street line defeated in 1902, 1903, and once again in June 1909, simplified the fourth attempt at passage by not mentioning a cross-park link. The bond issue called only for the money to rebuild the existing Geary line, extending it from Kearny and Market streets to the Ferry Building. In the Richmond District, the 5th Avenue tracks would be removed. Instead, the line would branch on 10th Avenue to Fulton Street and extend along Geary to the beach. (The original plan was altered at 33rd Avenue to bring the tracks up to Balboa Street, then to Cabrillo Street at 45th Avenue for an easier grade to La Playa.) With strong support from labor and low voter turnout on December 30, 1909, the bonds for the first municipal ownership of a transit line in San Francisco passed with a 72 percent majority. After surviving court challenges, the bonds were sold and construction began in the summer of 1911. On December 28, 1912, with Mayor Rolph acting as motorman on the first car, the Municipal Railway A line left from Market Street and terminated at 10th Avenue and Fulton Street. Once the A car reached Golden Gate Park, there was still no form of public transportation to cross the park. The largest transit issues of the day were planning transportation routes to the fair ground in Harbor View (now the Marina District) in time for the 1915 Panama Pacific International Exposition (PPIE) and the building of the Twin Peaks Tunnel to open residential tracts west of the Peaks. 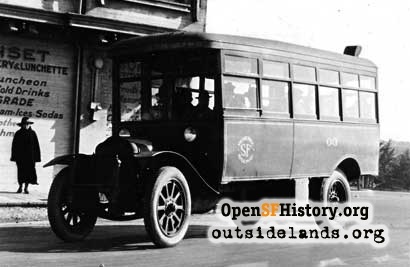 In 1912, the City hired the foremost public transit engineer in the United States, Bion J. Arnold, to develop a master transportation plan for San Francisco and make specific recommendations for ways to move thousands of people daily to the PPIE grounds. In Arnold's March 1913 report to the mayor and Board of Supervisors, he also addressed the park crossing. He recommended three crossings of the park by streetcar. The first priority, as Arnold saw it, was to build a rail line near the band concourse and museum area, running from 10th Avenue and Fulton to 9th Avenue and Lincoln Way, "with a slight detour around the music pavilion." He also recommended a direct rail line just west of the stadium and Spreckels Lake, joining 37th Avenue on both sides of the Park. The third recommendation was a route from 24th Avenue and Fulton to 20th Avenue and Lincoln Way. Arnold only spoke generally about these concepts, so no engineering studies were prepared. He did feel that tunneling in the soft sand of Golden Gate Park was unwise and unnecessary, so his report contained three options for depression cuts. Despite Commissioner Metson's objection, the Board of Supervisors adopted the plan for the extension of the Municipal Railway through Golden Gate Park on September 20, 1915, and Mayor Rolph signed it a week later. A contract for five specially designed 19-passenger "automobile buses" was awarded to the White Company in February 1917, but delivery was delayed once the United States entered the Great War in April of that year. On September 1, 1917, the cross-park Municipal Railway Route #1 was instituted with rented buses. The route would follow almost exactly the route through the park proposed by Bion J. Arnold, from 10th Avenue and Fulton Street to 9th Avenue and Lincoln Way. To serve the growing Sunset District, the bus route would continue south on 9th Avenue to Judah, west to 16th Avenue, then north a block to Irving Street continuing to 48th Avenue. The specially constructed White buses were delivered and placed in service on January 15, 1918. The Muni Route #1 was not an immediate financial success. In the first three months of operation, it lost an average of $80 a day. Three years later, the line had only improved to losing $70 a day. In the 1920s, after the completion of the Twin Peaks Tunnel (1918) and then the Sunset Tunnel (1928), ridership greatly increased across Golden Gate Park, primarily because the massive homebuilding on both sides of the park during that decade increased the population in those areas. The cross-park streetcar fights left a lasting legacy in San Francisco. The park was never disfigured with streetcar tracks, either above or below ground. Ironically, although a subway was never built under Golden Gate Park, the 10th Avenue and Fulton entrance was recently converted to a tunnel for the underground parking area on both sides of the Music Concourse. 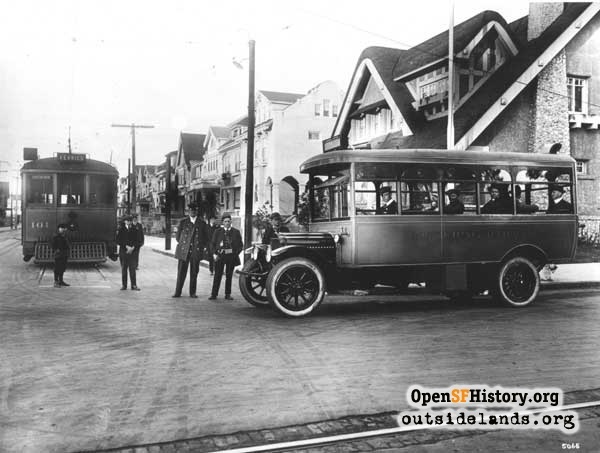 The bus route through the park initiated in 1917 has continued to serve the community, first as Muni Route #1, later as the #10 Monterey, and today as the #44 O'Shaughnessy line. The line's terminus and north side of park entry has varied over time, but the route within the park is still the same. The compromise route from 12th Avenue and Fulton Street to 20th Avenue and Lincoln Way was never built as proposed, but twenty years later, with the completion of the Golden Gate Bridge, State Highway #1 would be built through the Presidio, along Park Presidio Boulevard and across Golden Gate Park to 19th Avenue in the Sunset District. The three-lane Highway #1 route through the park contains a bridge over, instead of under, Main Drive (now John F. Kennedy Drive), but the route is virtually the same as proposed in 1916. Thousands of vehicles use this route daily and it serves two Municipal Railway bus routes. Today, John F. Kennedy Drive is closed to vehicles every Sunday and on Saturdays for half the year, but tour buses and parkers headed for the popular Academy of Sciences and de Young Museum add to the congestion. There has never been a lasting solution to the traffic problems in the park, but the events nearly a hundred years ago did provide for a compromise plan for north-south travel without major disruption to the beauty of this urban oasis. Page launched 27 March 2009.